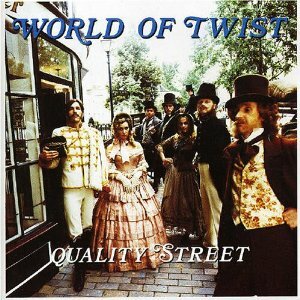 Hailing from Cheadle Hulme, Cheshire, the 23-year-old Anthony William Ogden formed the World of Twist in 1985 with Sheffield based Jamie Fry (brother of Martin of ABC fame). With Fry taking care of vocal duties and Ogden the drums, Gordon King, a friend of Ogdens from Stockport College was recruited on guitar, along with Rory Conolly (Sax), Nick Phillips (organ) and Andy Robbins (synth). This nascent band line-up of line-up proved short-lived however and King and Ogden migrated to Manchester where they linked up with Andy Hobson (bass/keyboards) and Neil Drabble (visuals) in a new reincarnation of the World of Twist. 1989 saw a third line up change in four years. Ogden, now on vocals, remained loyal to King and Hobson with Alan Frost (aka Adge) joining on synth/visuals, Julia McShells (aka M.C. Shells) on what the band described as ‘swirls and sea noises’, and Angela Reilly on visuals. Nick Sanderson joined on drums soon after. With a sound described as a combination of Roxy Music, Northern Soul and early acid house, the new World of Twist produced a legendary demo tape comprising of tracks ‘The Storm’, ‘Blackpool Tower Suite’, ‘The Spring’ and ‘She’s A Rainbow’. Signing to Circa Records resolved the A&R frenzy around the band and the first two singles only narrowly missed breaching the UK ‘s top 40. John Peel and Mark Goodyear were both advocates of the band and this exposure, along with an overstated live set featuring copious amounts of tin foil, fuelled intense anticipation in the band’s first long player release, ‘Quality Street’. When it finally hit the streets however the album was met with a degree of critical opinion, it being concluded that the record failed to capture the energy of the live set and the promise of the early singles. Work began on a follow-up, but with Ogden now stating publicly that he no longer wanted to assume vocal responsibilities, creative tensions in the band come to the fore whilst Circa fuelled the flames by pushing for a hit. As a result the demo tapes for the second album remained just that. World of Twist ceased to exist in June 1992. Tony Ogden drifted away from the Manchester music scene, becoming a semi-recluse, before tragically passing away at the age of 44 on 26th July 2006 in Bramhill, Greater Manchester. At the time of his death Ogden had been planning a return to music with a new band ‘Bubblegum Secret Pop Explosion’. Nick Sanderson went on to swap the drum stool for the mic and, linking up again with Jamie Fry, formed Earl Brutus, a band that achieved huge creative acclaim if not commercial success. When Earl Brutus came to an end Sanderson became a train driver on the Brighton to London line until his untimely death in June 2008. 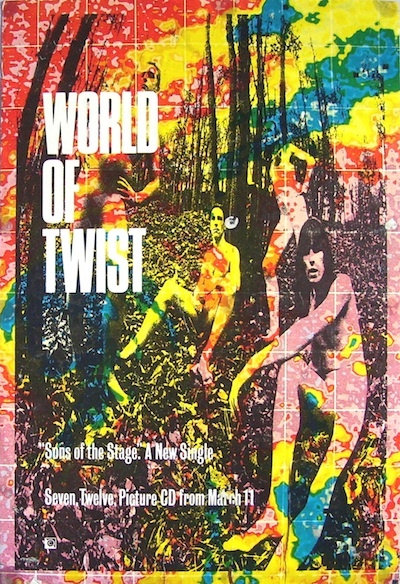 World of Twist’s gig at the Manchester Ritz on 23rd December 1990 retains a prominent place in Manchester folklore.